I arrived to Tirana airport in the mid-morning, collected my backpack and tried to leave the airport. I had been told that I could catch a furgon from the airport to Shkoder instead of taking a taxi to Tirana and then taking a furgon from there, as the airport is on the way to Shkoder. I was quite excited to hear this, as it would save me a trip to Tirana, where I would no doubt get frustrated and angry. Where to get on, however, was not so simple. After walking through customs I was immediately harangued by taxi drivers offering me their services to Tirana. No, I responded to them, I was looking for the furgon to Shkoder. They told me that this furgondid not exist, that I would have to go to Tirana, and that their taxi was just over there. I muttered to myself in disapproval and walked out of the airport, determined to find where I would find this minibus. In these situations, though, you will neither escape the taxi drivers nor get any useful information out of them. Just when you think you’ve gotten away from them, there’s one still latched to you, knowing that you don’t know where you’re going and you’ll eventually need to crack. The taxi driver was following me, telling me that there was no furgon to Shkoder, and I was scanning the parking lot looking for where there might be one. I finally decided that I wouldn’t find it. Since the taxi drivers all wanted to take me to Tirana, they weren’t going to tell me where to get on the furgon, so I got into a cab for Tirana. I tried to negotiate the price, but it’s a fixed rate, so I wasn’t very successful. Around an hour later on the furgon, we passed the airport. I got off the bus in Shkoder and started heading to where I was going to stay. I couldn’t afford the guesthouse where I’d been before, since I planned on being there for a few days. I was told to go to the Kuduku hotel, where someone there would take me to a little dorm room that I could rent out for ten Euros per night. This was where the guests for the meeting would be staying as well, but I hoped to be able to have my own room. After a little rest I went out to meet the woman with whom I had been in contact about coming to the meeting. She was going to inform me what this program was all about and what was going to be happening at this meeting. 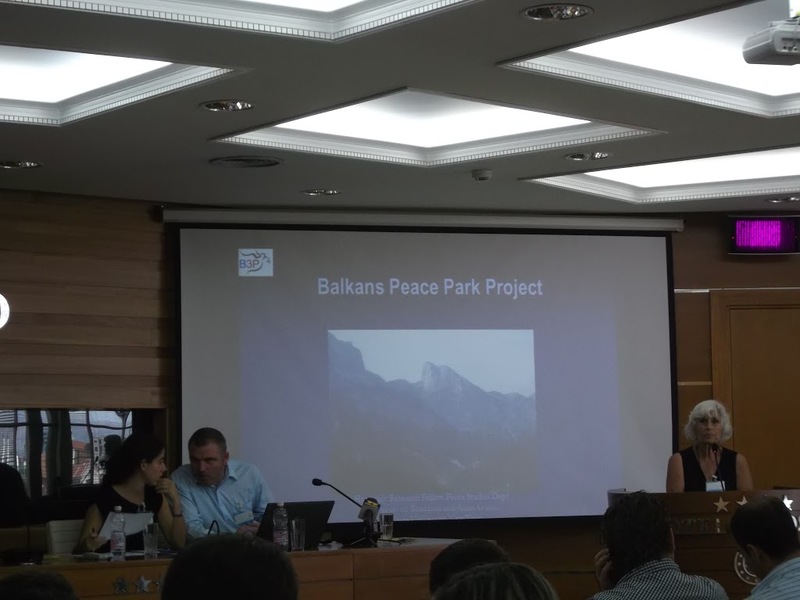 The purpose for this meeting was to help a proposed park in the border region of Albania, Kosovo and Montenegro become a reality. Participants from all three governments, representatives of other NGOs, guest house owners in these mountain villages, Peace Corps volunteers, and a few other stragglers were expected to be there. For the past few days Antonia had been running all over Albania trying to remind everyone that this meeting was going to happen. The day before she had been in Tirana trying to remind the Albanian ministries that they had agreed to come to this meeting, but didn’t find many of them around. She didn’t know who was going to be there. This blog is not the correct format for me to comment on the meeting and the project in depth. It’s not my area of expertise; I don’t know anything about international development or Peace Studies or things like that, I was just interested to see if this was a program I would like to become involved in for summer teaching. I was a bit embarrassed because I was simply a lowly English teacher. I didn’t even have nice clothes. I was in my traveling clothes, ratty jeans I hadn’t washed since April and was bursting through the knees, my boots and a t-shirt. One of the Peace Corps volunteers was roughly my size, however, so I borrowed a shirt from him so I wouldn’t feel so self-conscious. I like the project and everyone at the meeting had the best of intentions. Unfortunately, however, the only representative of any of the governments’ ministries was from Kosovo’s Ministry of Environment. So for everyone’s good intentions and hard work, the actual people who could do something about this project were not present. 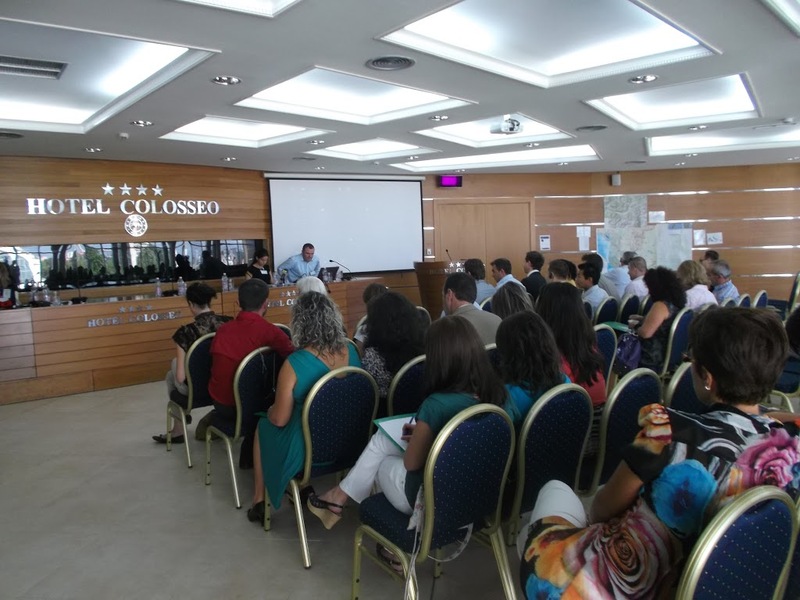 This resulted in lots of talk about needs analysis and how important it was for everyone to continue talking to the government ministries who weren’t there. Before the lunch break I was sent next door to talk to the restaurant owner who had prepared food for the guests. He liked to talk about his life story and how hard life is in Albania. He has great stories of how he wound up back in Shkoder after living most of his life in California. He’d run into hardship and eventually had to relocate back to Albania and set up this restaurant. He was immediately harassed by the mafia, and when he refused to cooperate with them, preferring to run his business legitimately, he started receiving threats. The day of the meeting, though, I came in with just a short message about the time of lunch, and then had to get back to the meeting. But he sat me down and got me a coffee. I forgot that they drink espresso with milk in the Balkans, though, so I stared forlornly at my milky coffee while the owner talked at me and shared his troubles. I tried to be polite but had to excuse myself to get back to the meeting. Round two of the meeting was similar to round one, and then at lunch we were at the restaurant. I talked to the Peace Corps volunteers and a few Albanians from another NGO there who told me that Ataturk was an Albanian. What? That’s absolute nonsense, I told them. But he was born in Salonica!Yes, you are right, but that still makes no sense. But Salonica was an Albanian city! This conversation amused, annoyed and perplexed me to no end. 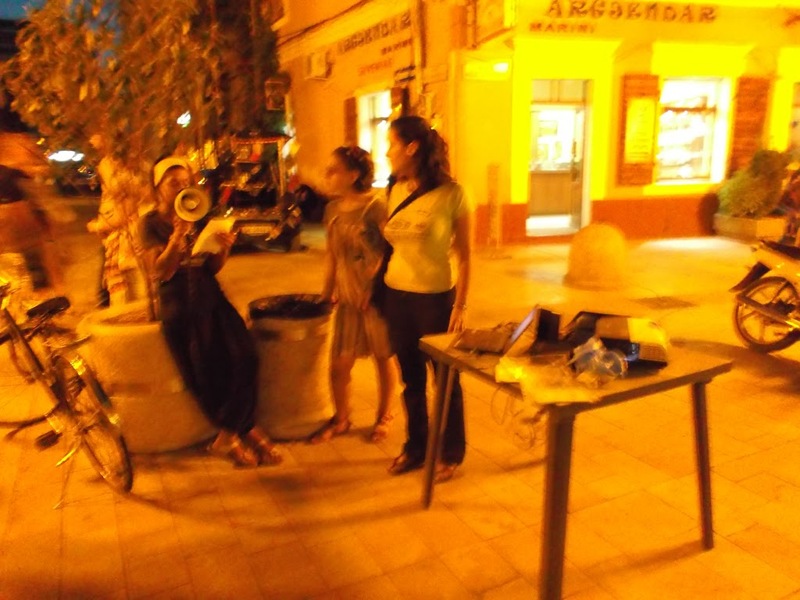 That evening we walked out and on Shkoder’s pedestrian street we saw a protest. 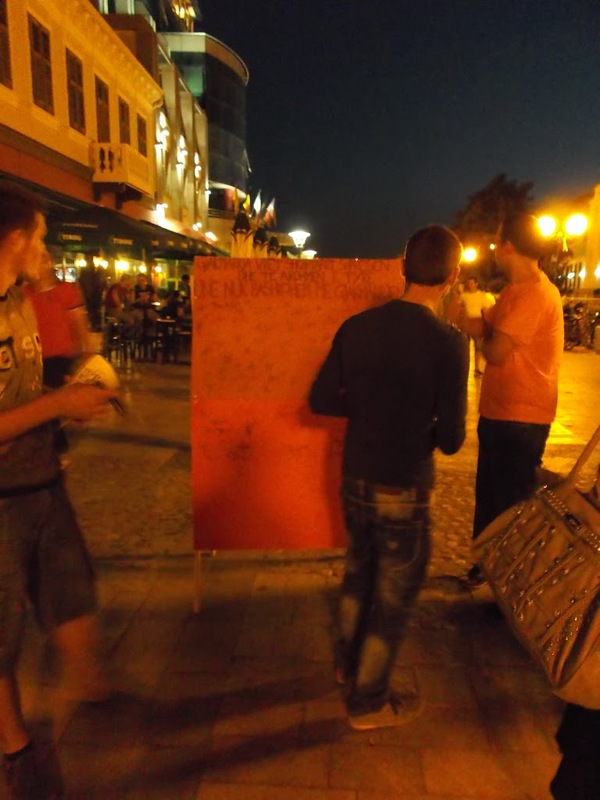 There were young people making an announcement on a megaphone, a projector showing an animated film, a board with a list of names on it, and another board with a collection of signatures. It was a gathering in protest about the abundance of blood feud murders in northern Albania. Say what you will about Enver Hoxha, at least under his totalitarian rule he stopped the blood feud tradition. In the past few years it has been coming back. 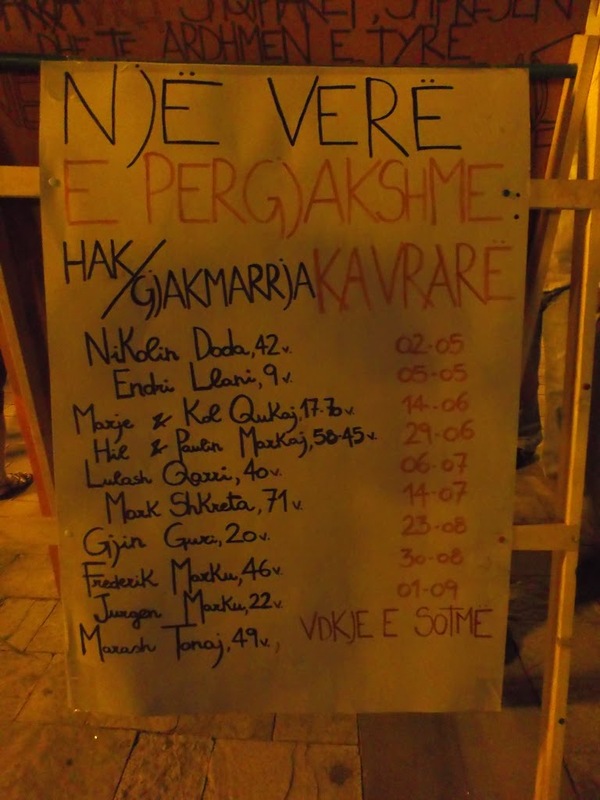 In the month since I had been in Shkoder last there had been another three murders, and I’m told that the total now is around twenty this year. The next day was a meeting just with the members of the project itself. The organization was going to be run entirely by the Albanian members from now on; it could not continue to be run from the U.K. I didn’t really participate in the meeting at all, I just observed. It reminded me of a scene in Monty Python’s Life of Brian. Visiting guests were upset and wanted to offer input, as they had traveled and taken time off work to be there and had valuable things to say. I went outside and drank tea. Bright and early the next morning I was going to head up to Valbone and walk up to stay with the family I had met on my prior visit. I checked out of my hotel room and found a place to print the photos from my camera to give to the family when I saw them. For my last evening I had arranged to stay with the Peace Corps volunteer I had met who had let me borrow his shirt. I was surprised by his lodgings. He had his own flat which was twice as big as my place in Istanbul had been. Internet connection, Smartphone, Tablet, movie projector, sofa, guitar, bed, 10 pairs of shoes… It wasn’t my picture of the Peace Corps. This was much nicer than Kutaisi, which was quite a lush place to be in Georgia. 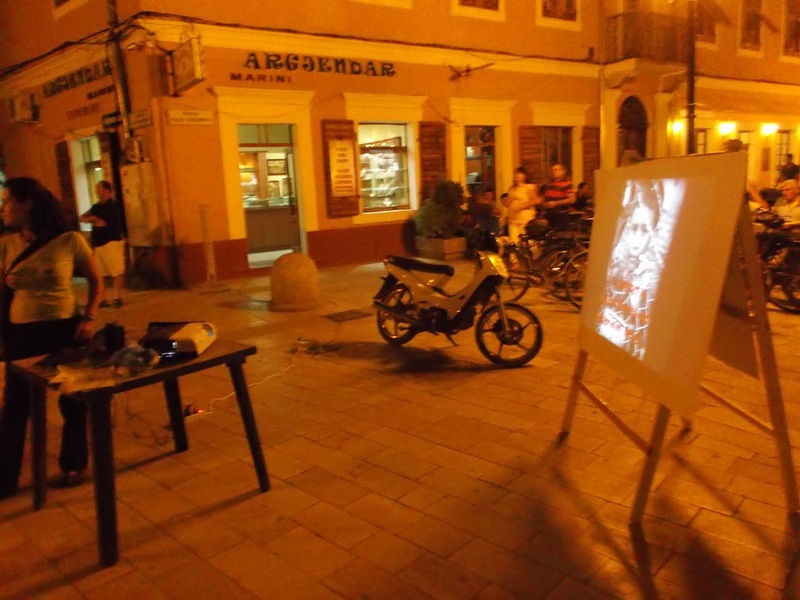 There were smooth roads, a pedestrian walkway, lots of bars and a cinema in Shkoder! Peace Corps Man had just left a six-figure job, was new to his new position and was quite idealistic about what he was going to be able to do. He eagerly tried to talk me into joining with lots of patronizing pats on the back. We went to a pub and met some other people from the meeting and drank beer. At one point we began discussing something Peace Corps Man didn’t agree with, so he stormed off in the rain and told me to send him a message when I was outside his gate. A while later, the rest of us went our separate ways and I headed back in the rain to Peace Corps Man’s flat. I tried calling him but the way Albanian phones work is that they have to call you before you can call them for some reason. So I was unable to send him a message or call him to unlock his gate. His flat was in a complex of flats surrounded by a large stone wall about two meters high. I would have to surmount this wall somehow to get into his flat. It was raining quite hard and there were deep puddles all around the base of the wall. After a few running attempts trying to navigate deep mud puddles, I was able to get a good hold on the wall and drag myself up by my fingertips. All of this noise greatly upset the dogs on the other side of the gate, who went berserk as I dropped down on the other side. Peace Corps Man had left his door unlocked for me. He was in his room watching films, grunted hello when I came in, but did not come out to talk. It was around 1am and I had to be on the furgon to Koman at 6:30. I tried to sleep but wasn’t able to, so I sat in the flat, writing in my journal. At 5:45 the next morning I was out the door, walking to catch the furgon to Koman for the ferry to Valbone.